Initially embarking in the direction of Before Sunset/Two for the Road, before taking an abrupt turn into Last Year at Marienbad/Track 29 territories, Kiarostami’s film begins innocently enough. 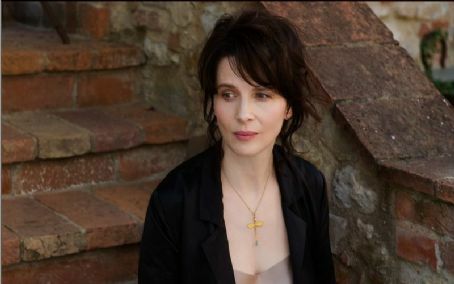 Elle (Juliet Binoche) is a French ex-pat living in Tuscany. A single mom, Elle supports herself and her pre-teen son by running a small art gallery. One day, she attends a lecture by a British art critic named James Miller (William Shimell). He’s promoting his latest book, which deals with art fakery, and the age-old existential question: If it is perceived as “art” in the eye of the beholder, does it matter if it’s “real”? Elle, who splits before the lecture ends, seems less fascinated by what the author has to say than she is by the man himself; although she blushes and vehemently denies as such when her precocious son teases her afterwards about her apparent crush. Self-consciously doing her best not to come off like a groupie, Elle introduces herself to James, and after he lets on that he has no particular plans until he has to catch his train that night, offers to take him on a tour of the countryside to catch a little local flavor. Hey-it’s Tuscany, right? And as we’ve learned from watching countless romantic movies set in the Tuscan countryside, what’s not to love about those sunny, pastoral vistas that inspired the likes of Michelangelo, daVinci, Donatello and Botticelli? This is not lost on the director or his DP Luca Bigazzi (Il Divo, Bread and Tulips) who allow us plenty of time and space to soak in the lovely views while Elle and James prattle on about love, life, art, meow-meow, etc. Just when you’re being lulled into thinking this is going to be one of those brainy, talky, yet pleasantly diverting romantic romps where you and your date can amuse yourselves by placing bets on “will they or won’t they-that is, if they can both shut up long enough to get down to business sometime before the credits roll” propositions, Kiarostami throws you a curveball. When a café proprietress mistakes James for Elle’s husband, marveling at how he seems to be treating his wife as if he is courting her for the first time, she decides to play along. While James is, erm, indisposed at the gent’s, Elle romances an entire back story on the spot, telling the woman that this is their 15th anniversary, and that they have decided to revisit the town where they spent their honeymoon. When James returns, he seems to intuit the Kabuki, and slides into character, picking up Elle’s narrative right on cue. Even after they leave the café, they don’t “break character”. Or is it Kabuki? Have they actually been married for 15 years-and all that blushing first date stuff was just a role-playing game? Perhaps this is an attempt to spruce up a tired relationship? Or is James a figment of Elle’s imagination…or vice versa? I’m not telling. Don’t worry, these are not spoilers. Because the director isn’t “telling” either (sly devil). I don’t even think he knows what’s going on with these two. You know what I think? I think that he wants us to think. I know-life throws enough curveballs at us every day. You’ve got enough to think about -why spend ten bucks on a movie that’s going to make your brain hurt even more? Because while you’re pondering, you have an impossibly attractive couple to ogle. Not to mention Binoche’s amazing performance; there’s pure poetry in every glance, every gesture. Shimell (no stranger to opera aficionados), is impressive as well in his first notable movie role. Then again, maybe this film isn’t so much about “thinking”, as it is about “perceiving”. Because if it’s true that a “film” is merely (if I may quote Mr. Welles once again) “a ribbon of dreams”-then Certified Copy, like any true work of art, is simply what you perceive it to be-nothing more, nothing less.